Crey Zee, ridden by Tatum Rice. Hart Photography. Crey Zee confirmed her impressive credentials on Monday night, with a 229 win under Tatum Rice, in the Ike Derby 4-Year-Old Open. 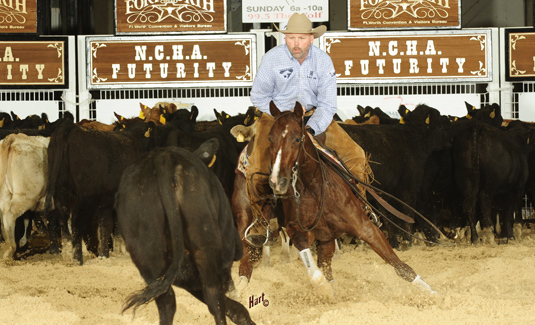 The 2018 NCHA Futurity Open champion, sired by Dual Rey and owned and bred by Kevin and Sydney Knight, Weatherford, Tex., earned $21,976 for the win, increasing her current NCHA earnings to $205,037. Metallics MVP, by Metallic Cat, scored 225 points under Austin Shepard to claim reserve and $18,753 for owner Billy Wolf, Whitesboro, Tex., who also owns the 2017 NCHA Futurity champion Dual Reyish LTE $356,551, also shown by Shepard. Reycan In The Cash scored 223 points for third place and $15,530 under Lloyd Cox, for Pat and Lisa Taylor, Pilot Point, Tex. Sired by Dual Rey and bred by Cinder Lakes Ranch, Reycan In The Cash came into the Ike Derby with money earned under Cox as third-place finalist in the Abilene Spectacular Open and as reserve champion of the NCHA Futurity Open Limited under Greg Wright. On Monday morning, Cox also won the Ike Derby Classic and was co-reserve champion on Second Spot and Blackish, respectively. CR Tuff Taboo, a Woody Be Tuff daughter, scored 221 points for fourth place and $12,308 with Boyd Rice. Bred by Center Ranch, the owner of Woody Be Tuff, CR Tuff Taboo LTE $125,326 also placed third in the NCHA Futurity under Rice. Crey Zee is out of the High Brow Cat daughter Eazee E. Shown exclusively for the Knights by Tatum Rice, Eazee E earned $211,145 during her NCHA career; Crey Zee is her first performer. Eazee E’s dam, Zee Dualy LTE $201,899, by Dual Pep, has produced 14 NCHA earners of $1.2 million, including Smooth Asa Zee LTE $616,978, by Smooth As A Cat. Metallics MVP, an NCHA Futurity Open and Open Limited finalist under Hayden Upton, was bred by Cows & Horses Etc, and is out of My Lizzy Babe LTE $163,653, a full sister to Moms Stylish Player LTE $349,238, and out of Moms Stylish Babe, a leading producer of earners of $1.2 million. Reycan In The Cash, out of Cancan Kitty, an unshown High Brow Cat daughter, is a full sister to Cancan Reyvolution LTE $176,682 and Kitty Can Dual $108,297, both shown as limited age event Non-Pro champions by Kelle Earnheart. CR Tuff Taboo is the second money earner out of unshown Cats Boonolena, a full sister, by High Brow Cat out of Peptolena Lucinda LTE $76,841, to 2013 NCHA Futurity Open champion Dual Smart Kitty LTE $316,251.